Students will learn practical grading skills on how to assess color, clarity and cut for ruby and sapphire, emphasizing how such factors affect their values in an ever-changing marketplace. With AIGS’s large collection of ruby and sapphire, students will get hands-on experience with exposure to the colors available with the gem variety as well as gain an understanding of the different qualities. AIGS students will have access to Asia Gem Center (AGC) and the many brokers who sell a wide variety of gemstones. They will develop and practice negotiating in real-life situations. Traders come from all over the world on regular buying trips at Chanthaburi. With numerous faceting factories, it is an ideal place to have gemstones cut as well. Student will have a chance to sit at a table at the Chanthaburi gem market and wait for brokers or dealers to bring goods to them to examine. 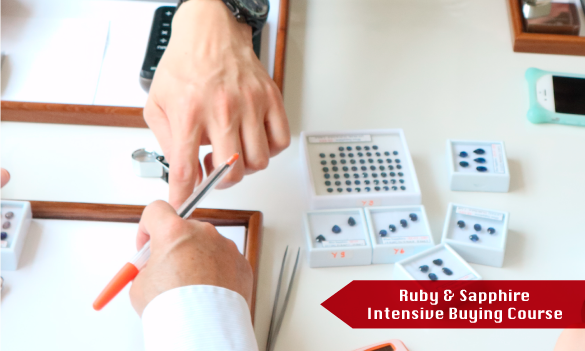 This course provides students with a grounding in the assessment of color, clarity and cut for ruby and sapphire, emphasizing how such factors affect their values in an ever-changing marketplace. The opportunity for extensive practice is provided through AIGS’s vast sample gemstone collection, which includes a wide-range of gem varieties and qualities. With AIGS’s large collection of ruby and sapphire, students will get hands-on experience with exposure to the many colors available with the gem variety as well as gain an understanding of the different qualities. As part of the course, AIGS students have access to Asia Gem Center (AGC) and the many brokers who sell a wide variety of gemstones. They will develop and practice negotiating in real-life situations. The Chanthaburi gem market is one of the most active in the world where weekends find buyers and sellers of gemstones converging on the town. Traders come from all over the world on regular buying trips. With numerous faceting factories, it is an ideal place to have gemstones cut as well. A two-day Chanthaburi field trip is included within this course, during which students get the opportunity to see the town’s famous gemstone market, as well as visit cutting and enhancement facilities. 25 Mar - 30 Mar, 2019 Register Now!